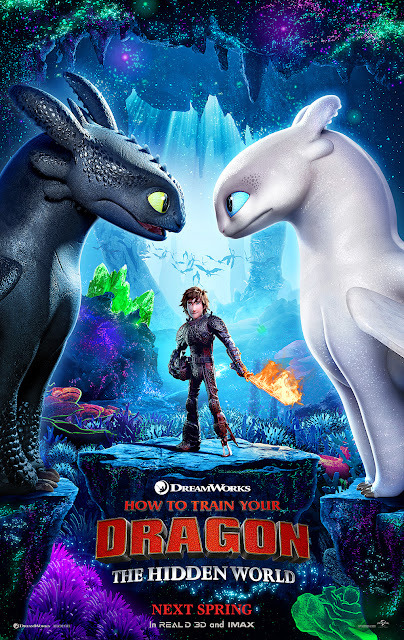 By the time this third How to Train Your Dragon film opens next March it will have been a longer period of waiting in between the second and third installments of the series than it was between the first and the second and that wait for the initial sequel seemed like forever. It was because of that longer than usual wait that it seemed the box office for 2014's How to Train Your Dragon 2 was not what either writer/director Dean DeBlois hoped for or what DreamWorks Animation was betting on. The film made only $177 million domestically on a $145 million budget, but thankfully there was the internations totals for the film which garnered this thing another $444 million bumping its worldwide haul to that of just over $620 million. And so, it is likely DreamWorks lowered the budget a bit, but was still happy to have DeBlois cap off his trilogy of films with the continuing adventures of Hiccup (Jay Baruchel) and Toothless. In this third and presumably final film (though there will no doubt be plenty of television series and maybe even spin-off movies should the brand endure) we see Hiccup fulfill his dream of creating a peaceful dragon utopia while Toothless' discovery of an untamed, elusive female Night Fury draws him away from his longtime friend. Of course, when danger mounts at home and Hiccup's reign as village chief is tested, both dragon and rider must make impossible decisions to save their kind. I've always had something of a soft spot for these films as they have both proved to be far better and far more enchanting and ambitious than I both expected them to be and in comparison to what DreamWorks usually rolls out in the animation department. There is a weight to these characters and their world and the emotion brought forth in both chapters thus far is notable in the beauty with which they are conveyed in the animation. That level of quality doesn't seem to have been diminished here despite that likely cut in the budget. The film looks flawless with it's sweeping landscapes and the characters look and feel as endearing as ever. How to Train Your Dragon: The Hidden World features the voice talents of America Ferrera, Cate Blanchett, Kit Harington, Craig Ferguson, F. Murray Abraham, T.J. Miller, Gerard Butler, Jonah Hill, Kristen Wiig, Djimon Hounsou, Christopher Mintz-Plasse, and opens on March 1st, 2019. Synopsis: What began as an unlikely friendship between an adolescent Viking and a fearsome Night Fury dragon has become an epic trilogy spanning their lives. In this next chapter, Hiccup and Toothless will finally discover their true destinies: the village chief as ruler of Berk alongside Astrid, and the dragon as leader of his own kind. As both ascend, the darkest threat they’ve yet faced—as well as the appearance of a female Night Fury—will test the bonds of their relationship like never before.